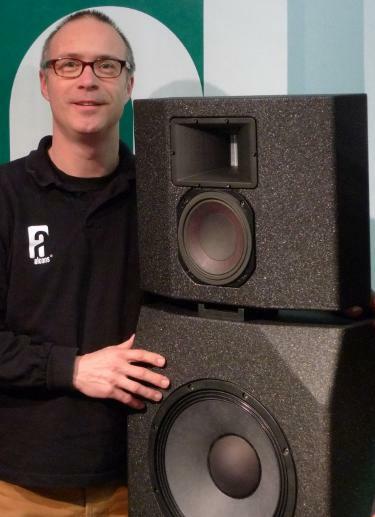 Tom Back with CRMScompact ISE 2013 saw Alcons Audio once again proving that the company’s patented Pro-Ribbon technology and ongoing pursuit of audio perfection keeps providing solutions for installation, cinema and sound reinforcement applications. The main focus of the stand was on the QR24 pro-ribbon line-source column, a modular, two-way column-array loudspeaker for acoustically challenging apllications. The compact QR24 delivers a full-range high SPL high fidelity sound quality, with outstanding intelligibility in even the most reverberant rooms, without the necessity of DSP-based beamsteering. Also the recently introduced BC332 compact cardioid subwoofer which features 18" plus 15" drivers in cardioid arrangement was showcased. The subwoofer cancels the sub frequencies on the rear of the cabinet, reducing the reverberant field to significantly improve the system's accuracy. Covering the (home) cinema side of Alcons’ solutions portfolio are the CR3 mid-sized (home) cinema screen system and CRS8 two-way reference surround system, both being shown at ISE for the first time. Recommended for larger home-theatres and auditoriums of up to 350 seats, the 3-way CR3 screen system is designed to meet all requirements of current and future Digital Cinema sound formats. Featuring Alcons’ pro-ribbon driver technology, it combines exceptional clarity and intelligibility from low to high output with an extraordinary high dynamic range. The-all new CRS8 is a 2-way 8” vented LF plus 4” pro-ribbon HF pro-ribbon surround system. By utilizing the same MHF components as in Alcons’ screen systems, a smooth match between screen and surround system can be achieved. company previewed the CRMS compact Cinema Reference Monitor System, with which the company makes its pro-ribbon cinema line-up more accessible to the residential home-cinema market. CRMS compact is a complete system, which includes shallow subwoofers, screen loudspeakers with newly developed 2” high-power pro-ribbon and matching pro-ribbon surround speakers. The CRMScompact system is with a mere 21cm/8-in. depth among the most shallow cinema systems on the market, enabling installation in nearly any space. Also first showing at ISE were the Sentinel 4 and Sentinel 12 amplified loudspeaker controllers. Featuring a 400MHz Analog Devices SHARC DSP processor with patent-pending Class D amplifier stages, the powerful Sentinel units feature full matrix routing, 192kHz capable AES/EBU inputs, audiophile-grade amplifier stages, custom-designed sample-rate conversion, remote-selectable input sensitivity and all-digital signal control and processing. The ALC’s are being used for delicate HiFi home-cinema’s, to even the largest concert touring applications. © 1997 © 2013 Pro-Music-News™. All rights reserved. Thank you for visiting Pro-Music-News™.